It's the biggest party of the year, and everyone is invited to come play! Click here to play! Enjoy the sights and sounds of Spring Break without even leaving your home as you party on into the night, winning massive cash payouts along the way. 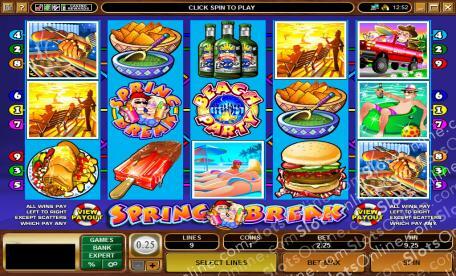 Spring Break is a fantastic 5-reel slot played across 9 pay lines. Whenever you win on a game of Spring Break you will have the option to double or quadruple your winnings via the Gamble option. The Spring Break symbol is Wild and offers up to 10,000 times your bet in winnings, as well as acting as a Substitute for any other symbol except Scatters. The Beach Party is Scattered and pays out whenever two or more appear on the reels. Spin up three or more and you will activate the free spins feature for lucrative winnings! Start your Spring Break early with this exciting slot machine, and begin the winning today! The Beach Party is Scattered, paying out up to 500 times your wager, as well as triggering the free spins feature when three or more appear on the reels. The Spring Break symbol is Wild and can be subbed for any other symbol on the reels except Scatters. It also offers odds of up to 10,000:1.